Vacation Rentals of North Myrtle Beach, a property rental and management company, is excited to offer some new specials for snowbirds and others visiting North Myrtle Beach this fall and winter. For more information, please visit http://www.vacationrentalsofnmb.com. Think the time to visit North Myrtle Beach has passed for the year? Actually, North Myrtle Beach is a year-round destination, and Vacation Rentals of North Myrtle Beach is pleased to offer some new specials for fall and winter vacations. Read on for property descriptions and more details. Additionally, guests will receive a $50 gift card for booking any of the properties below for the winter! Voted best marina on The Grand Strand, Harbourgate Marina has some of the best views in the area. This spacious 2BR/2BA condo has new living room furniture and a 42” flat screen TV. The area’s best attractions – like the Alabama Theatre – are a close boat or car ride away. The venue has a great fall lineup, as well as a great annual Christmas show! The property is also pet-friendly. Rent it from October to December for $950 a month. This spacious 2BR/2BA condo is located in a serene lake community in Barefoot Resort. With a fully stocked kitchen and TVs in every room, including a 42’’ LED TV in the living room, this unit is a great place for a leisurely winter. Barefoot Resort is close to the great stores and restaurants in Barefoot Landing. Get some Christmas shopping done and then have a nice dinner close to home! This property is pet-friendly as well. Rent it from December to February for $825 a month. Right on the beach, Sea Pointe is perfect for a cozy post-holiday vacation. One of the condo’s highlights is the balcony overlooking the beach, as well as a fully stocked kitchen and a whirlpool tub. Located in Cherry Grove, the condo is just a short drive from restaurants, shops and attractions. Additionally, Cherry Grove Pier offers fantastic views as well as late-season fishing. Sea Pointe is available for $725 a month. This cute 1BR, located on the 2nd floor of a quiet community, is only 3 blocks from the ocean in the Cherry Grove section of North Myrtle Beach. This clean, affordable condo has a queen bed in the master bedroom and a queen sleeper sofa in the living room, as well as a fully stocked kitchen and a washer/dryer. It’s also close to theaters like the Carolina Opry. Don’t forget that Vacation Rentals of North Myrtle Beach can book tickets and make reservations for guests. Tilghman Shores is available for $750 a month. 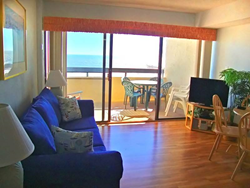 Vacation Rentals of North Myrtle Beach is conveniently located at 1021 2nd Avenue North, Suite 6 and can be contacted directly to discuss rental properties at 1-888-488-8588 or online at vacationrentalsofnmb.com.